Our advice process enables us to produce a unique financial plan for each client, so we can ultimately help you achieve your financial dreams and goals in the best possible way. We believe financial planning requires an examination of all aspects of your personal circumstances. We therefore view your financial wellbeing holistically, rather than taking a piecemeal approach that deals with issues independently and ignores the consequences of decisions made in isolation. For this reason, we gather information about you, your family and business. We conduct a Financial Needs Analysis to gain further insight into your financial situation and identify financial needs that may not be so obvious. Do you have any specific legacy requirements you would like to plan for, such as education policies for grandchildren? Do you have a risk management strategy in place, such as life insurance, group life or disability cover? If yes, please detail. Have you included all your leisure activity expenses in your monthly / annual budget? Do you believe your living expenses will remain the same after you retire? Please indicate any adjustments you believe you will make after retirement. Do you know what your accumulated wealth will be in 10 years and the amount you need for retirement? Our investment clients also complete a Risk Profile questionnaire, so we can identify the type of risk you as an investor are willing to take on. Clients are characterised according to age, income, accumulated wealth and investment horizon. 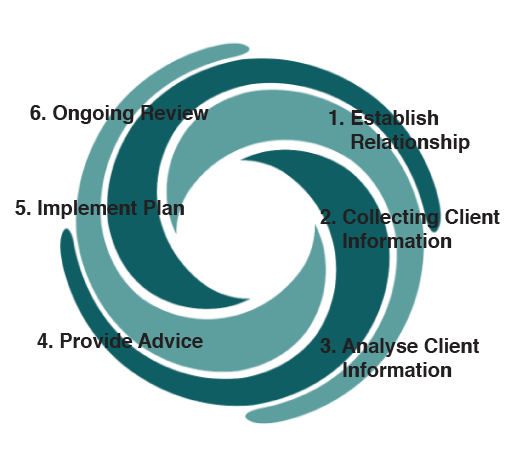 Using our tools, we provide a framework to assist you to make informed decisions. It takes into account your current financial circumstances and goals, as well as your future financial requirements. Our analysis gives you a clear perspective of your financial status. Our financial plan records your financial goals and details how these can be achieved. It also focuses on each of the holistic financial planning pillars. We provide the necessary information and assistance to ensure complete peace of mind and informed decision making. As independent financial planners, our advice across all aspects of financial decision making is objective. Your financial plan provides guidance for all future decisions, as it contextualises your financial situation and sets out a way to achieve your financial goals. It may be necessary to implement your financial plan in stages. Financial planning is an ongoing process, and we are committed to monitoring your circumstances within the agreed plan. Reviewing your situation enables us to ensure everything is on track to achieve your identified goals and objectives.